- frequency and power measurements. 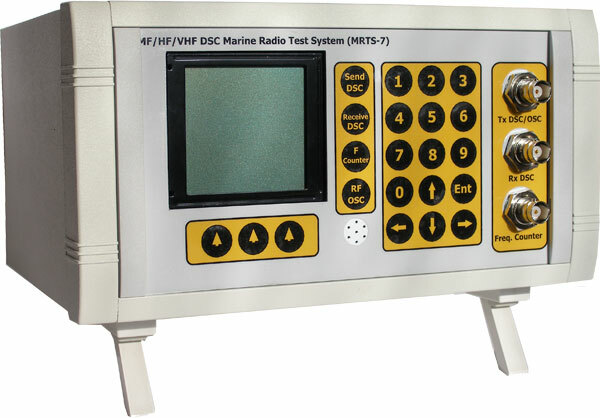 The tester is capable to receive the MF/HF/VHF radios emission working in normal mode without any connections by means of telescopic antenna, and transmit the DSC message both by means of telescopic antenna and direct HF cable connection to DSC receiver input. ● measure the signals frequency in range 0,1 - 640 MHz. The tester is power supplied by external 7-10VDC power supply unit, not less 600mA load current. The level of received signal is measured and displayed. The DSC message content can be decoded and viewed on LCD display. All test results can be stored for further printout or processing by PC. Tester allows to measure the frequencies in range from 100kHz to 1000MHz at signal level of -30dBm/7.07mVrms till 20dBm/Vrms.